Career politician and oculist member of Bohemian Grove. The book “Creating a New Civilization” by Globalist Alvin Toffler and his wife Heidi was vehemently opposed to the United States as it stands under the Constitution. Yet Newt Gingrich loved the book so much not only did he write the foreword to it, but he also gave a free copy to every one of the 465 members of the House of Representatives. In an interview with New York Times writer Maureen Dowd she asked Gingrich’s spokesman Tony Blankley why Gingrich was planing on attending Bohemian Grove. Blankley responded “Even Newt pays his obeisance to the Establishment -- which he is trying to change”. When asked about the contents or a transcript of a speech given by then House Speaker Gingrich his staff writer Robert George responded “I’m sorry - We do not have a copy of that speech, and it will not be transcribed ... The Bohemian Grove events are basically private functions”. 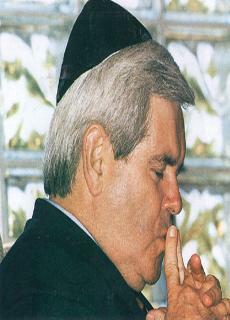 Gingrich converts from Southern Baptist to Catholicism. Asked what his role is at the Bohemian Grove, Freemasonry, and the CFR Gingrich responds “I don’t belong to the Bohemian Club, I have no role in freemasonry. And my primary activity in Council on Foreign Relations was on figuring out how to fight terrorism”. The statement about Bohemian Club is a lie seeing that his face graces the pages of leaked Bohemian Grove annuals. Luke Rudkowski with We Are Change confronts Newt Gingrich about attending Bohemian grove to which Gingrich plays stupid - acting like he does not even know what Bohemian Club is.